Every city seems to have its floating population of disaffected youth — school dropouts, occasional workers, drug users, skateboarders, hooligans, street people. How much of a problem is this? What are its dimensions? What are the social causes that influence the size and nature of this population in Detroit, Manchester, Cologne, or Novosibirsk? And are there social programs that can significantly diminish the number of young people who wind up in this category? As for the importance of the problem, there are at least two aspects. In some times and places this population becomes a source of violence — youth gangs, football hooliganism, shop window breakage, and skinhead attacks on racial minorities, gays, or other targets. But second, whether violent or passive, the precipitation of a sub-class of young people with no skills, no jobs, and no futures is a huge social cost for the societies that produce them. Most young people in the UK make relatively ‘successful’, unproblematic transitions from school to work and adulthood. What do we call those that do not? Labels imply explanation, not just description. Terms with academic and policy currency tend to define such young people by something they are not or by their presumed social and economic distance and dislocation from ‘the rest’. How we might best describe, explain and label the experience and problem of so-called ‘socially excluded’, ‘disconnected youth’ is the focus of the paper. To use the term “disaffected” is to bring a Durkheimian mindset to the table; it is to offer the beginnings of a diagnosis of the problem as well as a description. The phrase “disaffected” (or its cognate, “demoralized”) presents the problem as one of disconnection from prevailing social values and alienation from a set of moral ideas about how to behave. The “disaffected” no longer believe in the old chestnuts about working hard, listening to one’s parents, showing respect to others, obeying the law, and conforming to society’s expectations. So on this line of thought, the anti-social behavior of young people in this category derives from their “demoralization” — their failure, or society’s failure, to absorb a compelling set of normative standards about personal and social conduct. And what about the factor of motivation and personal ambition? To what extent is normal youth development propelled by internal factors of motivation and aspiration? And how much of a role does a social context that “demotivates” young people play in this picture? Another line of thought has emerged out of research on youth gangs — the idea of the positive forms of solidarity and community that are provided by the gang as a welcoming social group. Young people who have lost the social support of their families and other traditional organizations may find that the street gang is the closest thing to “home” that they are able to locate. These are social groups with their own codes of behavior — even though their largest effects are profoundly anti-social. A common recourse when it comes to trying to explain these kinds of outcomes is to refer to various “breakdowns” — breakdowns of the traditional family, of schools, of religion, of community organizations, or of public values. These are the institutions through which young people form their social psychologies, their identities, and their basic values. But if the young person lacks an emotionally meaningful connection to adults through some of these institutions, where will those positive social values come from? Finally, it is worth noting that poverty and socio-economic disadvantage are not the only settings where youth disaffection occurs. Many observers in the United States have written about the use of drugs by affluent suburban high school students and other forms of involvement in anti-social activities. Wayne Wooden’s Renegade Kids, Suburban Outlaws: From Youth Culture to Delinquency documents some of this behavior. Why is this an important problem for “understanding society”? Because the social processes through which the next generation of citizens — children, teenagers, and youth — is shaped are deeply influential on the nature of the society that will develop in twenty to forty years. If “disaffection,” “anger,” “demoralization,” and a propensity for anti-social behavior are inculcated in a large minority of the youth cohort, then society is likely to go through some very hard times in the coming decades. It’s relatively easy to find some dimensions of these issues on the web. Here is an interesting report on “football hooliganism” prepared by Dr. Geoff Pearson of the Football Industry Group. 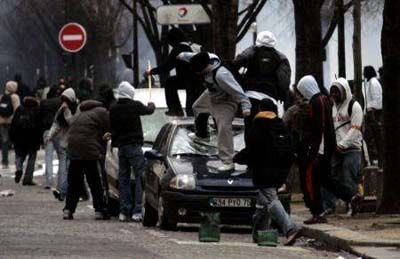 Here is a blog posting from the UK on youth gangs and terrorist organizations. Here is a quick report on skinheads. Skateboarders?What’s your problem with youth who enjoys skateboarding? My son and his friends do it here in Cologne and I would not place them into your “disaffected youth” listing: school dropouts, occasional workers, drug users, skateboarders, hooligans, street people. This is ridiculous. Stephan, fair enough. I stand corrected. Daniel: many thanks for your correction in regard to skateboarders ;-)Your post raises a lot of important questions but I miss an explanation what might be the cause of the problems? So may I add my 2 cent from a pragmatic non-academic liberal (= really liberal != not GOP liberal 😉 view:We’ve simply abandoned the idea of meritocracy! Instead we’re about to refeudalize society. I can shower time and money on my son and he can do sports, get classes beside government sponsored schooling and whatever deems necessary. Unfortunately my Turkish grocer is not in this position.Life chances are a function of options and ligatures according to Ralf Dahrendorf. We don’t provide chances because society does not fund options and people don’t want to hear about ligatures. “Ligatures without options are oppressive, whereas options without bonds are meaningless”.The problem is: if we stick to close to the liberal ideal of non-interference in people’s matters we ironically create a class-based society of people who can support their children and who can not. The alternative is to strike a deal to provide everybody with the Dahrendorf “life chance”. Stephan, The mechanism you mention surely does work to continue existing inequalities into the next generation. But how does that contribute to an explanation of the “disaffected”, exactly? Is it the simple logic mentioned in the posting that “reduced hopes for the future lead to disaffection”? Certainly some of the grocer’s sons and daughters wind up with engaged and accomplished lives; so what explains the difference in outcome? (That’s the point of the Macdonald article cited here.) I suppose we might hypothesize or discover a set of positive and negative risk factors for being disaffected and the try to explain the population outcome based on the distribution of those factors at a time. This would me a mechanisms explanation cpnjoined with epidemiological reasoning. Skateboarders are often criminalized(trespassing/no skate areas)and do represent a unique teen subculture. Isn’t this topic really about youth searching identity and an extended family network. Some research has suggested one of the most popular reasons for joining military service is identity through extended family. As we move toward a “choose your own Truth” liberalism in our ultra-mobile society, we lose cultural roots and face unknown challenges in the face of unknown freedom. Interesting article. For a response to the educational problem – or perhaps "those extraordinary societal failings expressed through our schools" – visit Action on Education at actiononeducation.org…The future of education in this and every other nation. For a response to the educational problem – or perhaps "those extraordinary societal failings expressed through our schools" – visit Action on Education at actiononeducation.org…The future of education in this and all other nations. I think there is an assumption here that poverty = crime, as though nobody middle-class or upwards could ever dream of criminal behaviour because of all the benefits they have had in life. However, if I remember rightly, a lot of the hooliganism in 70's football was caused by respectable, middle-class, reasonably educated, hardworking men. So what was their "problem"?The Roman Emperors Nero and Caligula used to regularly go out at night with "friends" to rough people up: and they were the most powerful men of their times, with more wealth, power and resources that even Bill Gates could imagine. So why did they do it?The crusades were a convenient way to dispose of dangerous aristocratic youths. I am assuming you've heard of the phrase "robber baron"? It stems from pre-crusade times when wealthy, well-born men robbed any persons they could lay their hands on. So why did they do it?The answer is very simple: they did it because they could.And why do these "disaffected" youths do it today? Because they can.And when they've grown older (as I doubt they'll grow up) their places will be taken by more supposedly "disaffected" youths whom the middle-classes will automatically assume cannot possibly be like them.